There are some apps that I classify as content apps. These types of apps tend to be quite specialized and content driven. The beauty of "content apps" is that the very best ones present information in rich multimedia formats. These can be great to use as the basis for small units of work. The UNHCR app is one "content app" that I particularly like. It tells the story of three young refugees. Each refugee from a different country. The narrative is told based on the decisions that the reader makes as they are presented with different scenarios in the journey to safety. Combined with a series of other apps it is a fantastic way to to build empathy within your classroom. This provides a focal point for developing cultural understanding and the sharing of cultural traditions. This activity will work with small groups of shared iPads. Working in groups, the students are able to select appropriate apps and tools to support their learning. Those suggested are provided as a guide only. This approach allows the students to negotiate learning tasks with their teacher to ensure a student choice and a student voice. The knowledge captured also facilitates a student centric construct of social, cultural and political knowledge. This is a pertinent exercise in the current political climate. The second activity allows teachers to scaffold research tasks for young learners in historical and critical studies. The Vincent Letters App is a fantastic starting point for learning more about Vincent van Gogh. 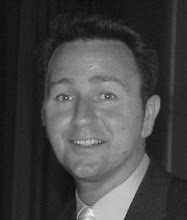 It includes high definition images of his work and numerous informative videos. Students can do all or chose to complete only a couple of these activities. The historical knowledge also facilitates a student appreciation of the constraints and artistic struggles that van Gogh experienced. This is even better when the students are also attempting to complete a painting using a theme or subject matter that van Gogh explored. Both of these activities can be easy modified for many different issues, topics or subject areas. I have recently been asked to provide a number iPad sessions for teachers. I had one school where they had recently bought a large number of iPads and wanted to start from scratch. Another had a 1:1 Program in a particular year group but wanted their colleagues to get an understanding of the potential of iPads in the classroom. I was able to use this Teacher ToolKit idea for both groups. Another one of the ideas I have been using was one that I borrowed from a talented friend and inspirational teacher in New Zealand - Allanah King @AllanahK. 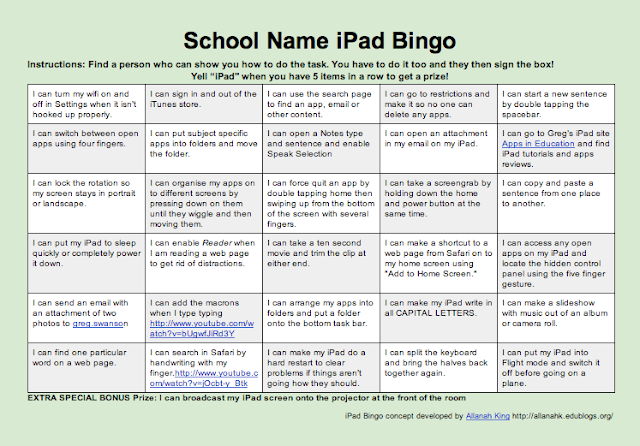 She published her iPad Bingo idea on her blog a couple of months ago. I have used it numerous times since and it has been a success each time. I make sure that every time I use it I credit her with the concept. Here it is in it's latest incarnation updated for iOS 7. Make sure you visit Allanah's blog for a heap of other great stuff. Make a copy and put your own school name or crest at the top. It is always good for staff to see resources specifically designed for them. Schools have also used this as part of Bootcamps for iPad Rollouts with students. They love it as well.